. 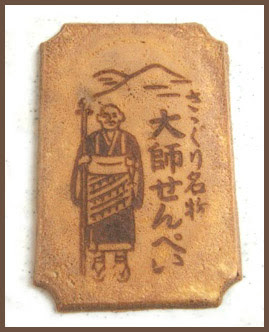 Amulets for the Kukai Pilgrim .
. Pilgrim's Stamp Book 納経帳 nookyoochoo . Here is the diary of a Henro walk from a cute little pilgrim with his Grandmother, Yuko Fujita. Fujita san visited my Daruma Museum the other day ! However, in the case of walking pilgrims, who might do it for such reasons as mentioned above might also the pilgrimage for ascetic training, just to walk it or for a spiritual reason such as to "find oneself" or "to soothe one's soul" or for personal training. The pilgrim attire, such as the white vest and Kongo staff, act as a way to clearly separate pilgrims from regular travelers and if one also includes the hat, gloves and leg bands one becomes an even more full-dressed pilgrim. Even in the present day, most pilgrims wear such attire and walk the mountains and roads of Shikoku and although this appearance may look strange in the big cities, it fits in with the landscape of Shikoku. While there are many motives for journeying on the Shikoku pilgrimage route, in most cases, people return home with a greater degree of satisfaction than they had expected to have before they departed. And while the struggle and conquest over bad roads, bad weather and one’s stamina are important as experiences to help one focus on oneself, the one thing that impresses all people the most is the receiving of charitable gifts along the way which is the representative way of interaction between the pilgrims and the local people. 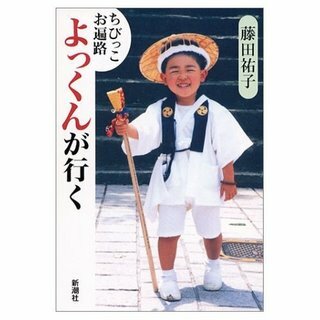 Osettai is the action of giving presents, such as food, by the local people to pilgrims. In olden times, vending machines and convenience stores did not exist so due to this form of giving pilgrims were able to survive the journey. Rice and tissue were important items of osettai. On one hand, from the religious viewpoint of the local people, giving to pilgrims was important because they are considered to be the transformed body of Kobo Daishi and that pilgrims will go around to each temple on my behalf. As well, the gifts given will not only act as a form of assistance to someone struggling along the pilgrimage route, but that those goods are actually gifts to the Gods. The custom of osettai is still prevalent today; however those who travel by car and bus while have few opportunities to experience this charity. On the other hand when one becomes a walking pilgrim there will be many occasions to receive osettai from people one passes on the road or from people who live in the homes one passes. By wearing the garb of a Shikoku pilgrim, one is recognized as an OHenro-san and one can exchange warm greetings with others who will be receptive and show you the way. This experience is quite removed from the present-day lifestyle in which one must obtain and maintain one’s place in society through self expression. 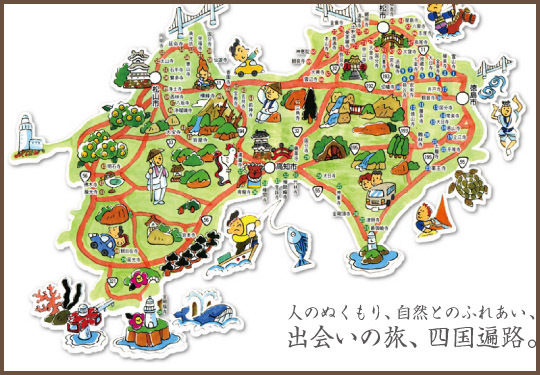 This homepage offers practical information for becoming a Shikoku pilgrim with a focus on walking pilgrims. Rice Crackers for the Pilgrim ! 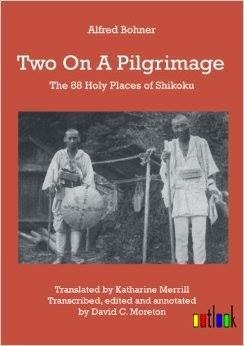 A young woman of 24 set off alone in 1918 to walk the 1400 kilometre pilgrimage route around the island of Shikoku. Her dream of a solitary journey ended when an old man of 73 met early on her journey insisted that he accompany her as servant and protector because he believed that she was an attendant of Kannon Bosatsu. This book is her account of their extraordinary experiences during the five month journey. The 105 newspaper articles that she wrote while making her pilgrimage made her a celebrity in Japan. 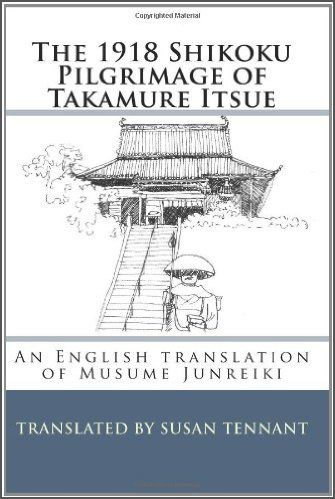 In later years the woman, Takamure Itsue, became well known in Japan as a poet, intellectual, scholar, historian, feminist and anarchist. Introducing most online material for each temple ! From Temple Nr. 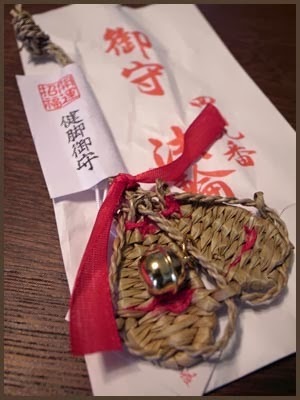 44 大宝寺 to 53 円明寺 in the Matsuyama region, the amulets of pilgrims are floated in the sea at Takahama beach 高浜沖. On the 28th day of the third lunar month, now in April. CLICK for more waraji 草鞋 straw sandal amulets.
. waraji　草鞋 zoori 草履　straw sandals and amulets .
. Henro 四国お遍路さん Henro Pilgrims Dolls from Shikoku . 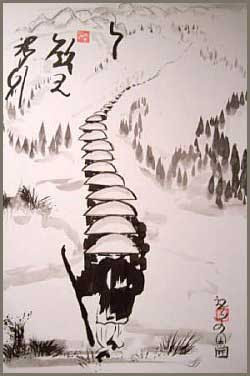 Groups of seven Henro pilgrims killed or died in Shikoku. comprises many kigo for spring and autumn.
. KIGO for the henro pilgrimage . and writing a travel guide, published in 1687. Originally from Canada I first came to Japan in 1988 and have lived in Kyoto, Osaka and Tokushima for the past twenty-five years. I completed my BA (1995) and MA (2001) at the Asian Studies Department at the University of British Columbia. Since 1999 I have been researching various aspects of the Shikoku pilgrimage route, but mostly focussing on the history of Westerners and the pilgrimage.